FT. BEND COUNTY, TX (KTRK) -- Two suspected burglars stared right at a surveillance camera during a reported break-in in Ft. Bend County on New Year's Eve. It happened at a home in the 8300 block of Indigo Villa Lane in the Park at Mission Glen subdivision. Deputies say they got inside by breaking a living room window in the back of the house. 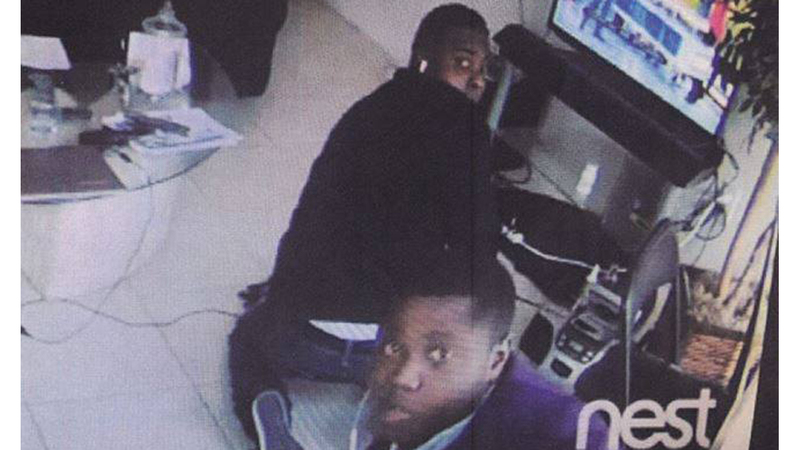 They got away with a television, a laptop and other items associated with the TV system. The victim, who was at work at the time, watched the suspects on her cell phone through a wi-fi video camera system. She says she took still photos of the suspects with her phone, but since they also stole the camera, detectives have no additional video. One suspect was wearing a purple sweater and the second subject was wearing a black sweater, blue jeans and black gloves. Both appear to be in their teens or early 20s. Anyone who has information on this crime is asked to call Fort Bend County Crime Stoppers at 281-342-TIPS (8477) or text FBCCS plus your tip to CRIMES (274637). Information, which leads to the apprehension and filing of charges on the suspect(s) involved, could earn you up to $5,000 cash reward. All calls to Crime Stoppers are anonymous.